The original SANDMAN B Attachment was constructed for use with the 1.5" diameter FissureMan Hand Dredge designs to provide a hose and bucket collection system that can be used to collect large amounts of gold bearing material. 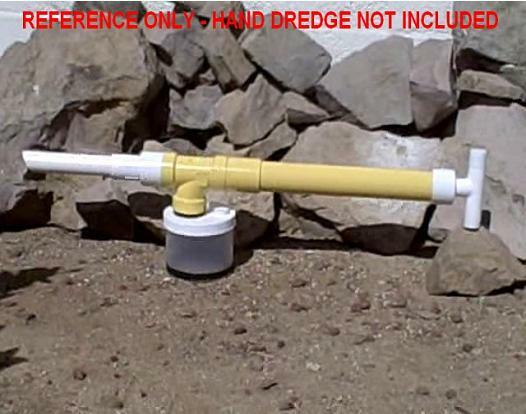 This new version of the SANDMAN, the "MINIMAN", is a smaller material collection attachment that does not require a hose to be connected from the hand dredge to the collection container. Since the hand dredge is connected directly to the collection jar it leaves the diver with one hand free to allow grasping of available handholds while maneuvering into place once a likely gold bearing structure is located. The MINIMAN has been constructed with the prospector in mind that performs river or creek diving to get at the crevices and pay dirt found in locations that are not as conducive to the use of a larger bucket and hose system. Using check valve technology similar to the SANDMAN B Attachment, you can pump and collect material without loss until the collection jar is full just like the larger hose and bucket system - just on a smaller scale. When working in deep or fast moving waterways an underwater prospector requires the ability to move about freely and still be able to collect substantial amounts of pay dirt before returning to the surface or shore to dump out and/or process the collected material. The fewer times an individual must return to shore to dump material the better as this allows for more productive working time spent for collection of material. The MINIMAN provides this needed collection capability with its large volume 32 oz. collection jar. Smooth walled collection cups can be a problem to detach from a hand dredge for cleanout when wearing diving gloves. 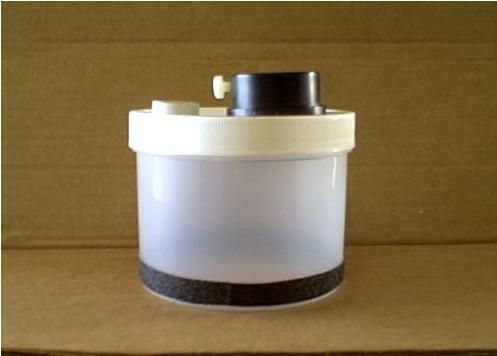 To remedy this issue the MINIMAN comes with a grip ring at the base of the collection jar that overcomes the jar's smooth surface to allow easy removal and cleanout of the jar without having to remove your gloves. You simply grasp the bottom of the jar and unscrew it from the attachment cap to empty the contents. Again, this is a time saver for productive material collection. Another time saving feature of this quality attachment is that the collection jar is translucent which allows viewing of the quantity of collected without having to open the collection jar each time to verify that there is enough for processing before returning to shore. Although designed with the diver in mind, the MINIMAN may also be used during other forms of sniping activities where larger material collection ability is desired that might not otherwise be accomplished as easily with the standard collection cups supplied with of the BLUEDOG and/or DIVER-DOWN Hand Dredge models. 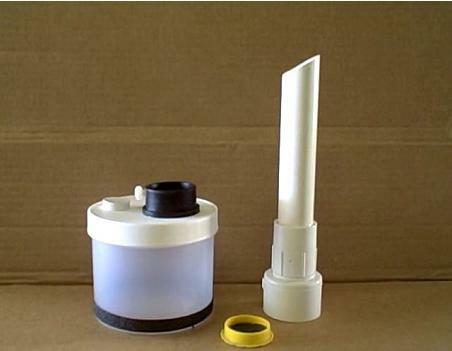 The MINIMAN will work and is available for either of the 1.5" diameter model Hand Dredges. Obtain one now with a new FissureMan Hand Dredge purchase or as an additional collection attachment if you already own a BLUEDOG or DIVER-DOWN Hand Dredge. The MINIMAN is available in two different configurations. Just specify which configuration you desire with a click of the appropriate "ADD TO CART" button below. Order this version if you already own or are purchasing a new BLUEDOG or DIVER-DOWN Hand Dredge without a SANDMAN B Attachment. 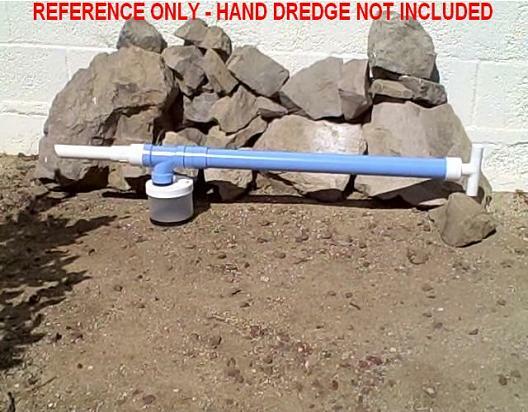 Order this version if you already own a BLUEDOG or DIVER-DOWN Hand Dredge and a SANDMAN B Attachment.